ZnO nanoparticles are the subject of intensive research to develop materials with tunable electric and magnetic properties and for potential medical applications in cancer treatment. In this example, a sample of thiol-capped ZnO nanoparticles was analyzed by simultaneous TGA-DSC (STA) utilizing the combination of a NETZSCH STA 449 F1 Jupiter thermal analyzer, a NETZSCH QMS 403 Aeolos mass spectrometer and a BRUKER Optics TENSOR FT-IR spectrometer, as shown in Figure 1, to conduct evolved gas analysis by QMS and FT-IR. The transfer lines, the FT-IR gas cell and the coupling adapters were maintained at a consistent temperature of 200 °C. 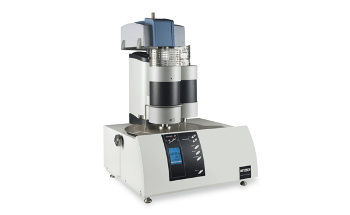 About 11.18 mg of the thiol-capped ZnO nanoparticles sample was pressed on the bottom of a Pt-Rh DSC crucible to create a 1-mm-thick layer, which was then heated from 30 °C to 1200 °C at 20 K/min heating rate under a nitrogen purge of 60 ml/min. The Gram Schmidt (total integral of the IR absorption), DSC, DTG (mass change rate), and TGA curves are plotted as depicted in Figure 2. The TGA curve illustrates five mass-loss steps with corresponding peaks in the DTG curve and respective endo-thermic features in the DSC curve as a result of desorption and decomposition processes in the sample. With the exception of the mild effect below 200 °C, the peak temperatures in the Gram Schmidt plot very much in line with the peak temperatures in the DTG curve. The DTG and TGA curves as well as the temperature-dependent integrated band areas (traces) for the anti-symmetric C=O stretching of carbon dioxide, the C-H stretching of hydrocarbons, and the O-H stretching of H2O are plotted in Figure 3. The results showed that the desorption of H2O and CO2 agree with the first four mass-loss steps, while the evolution of hydrocarbons in the mid-temperature range is in good agreement with the second and third mass loss steps in the TGA curve. The TGA curve and the MS ion-current curves for H2O (18; 17 and partially 16 u) and CO2 (44 and partially 16 u) plotted in Figure 4 provide more information thanks to the higher sensitivity of the MS; however the results are in line with the FT-IR traces that the evolution of H2O and CO2 corresponds with the first four mass-loss steps in the TGA curve. The TGA curve and the MS ion-current curves for SO2 (64; 48 amu) depicted in Figure 5 clearly reveal that SO2 evolve in small quantities at elevated temperatures with respect to the fifth mass loss step in the TGA curve. The MS ion-current curves for various organic fragments depicted in Figure 6 demonstrate that these species evolve as two peaks in good correspondence with the FT-IR results. 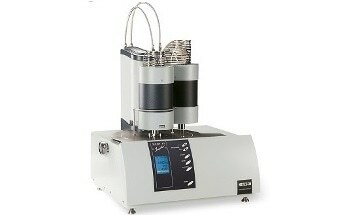 The combination of a simultaneous TGA/DSC (STA) instrument and MS and FT-IR spectrometers is a robust tool for characterizing samples as it provides information for the transformation temperatures and energetics (DSC), mass change (TGA), and evolved gas analysis (MS, FT-IR) in one measurement. 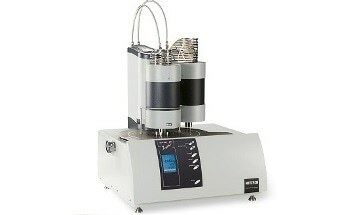 All the data analysis is performed with the NETZSCH Proteus software. Simultaneous use of MS and FT-IR for evolved gas analysis is highly useful due to the ability of the FT-IR to rapidly determine functional groups on the basis of their characteristic bands. Moreover, the higher sensitivity of the MS enables it to determine homonuclear diatomic molecules (H2, O2, N2) and atomic gases (Ar, Ne, He and much more), which cannot be detected by FT-IR.